↑ "Population by canton and municipality 1821 - 2017". Statistics Portal - Grand Duchy of Luxembourg. Retrieved 30 December 2017. 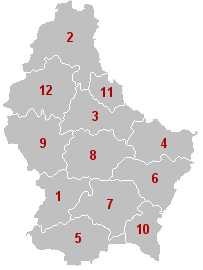 Wikimedia Commons has media related to Cantons of Luxembourg. This page was last changed on 6 December 2018, at 09:28.